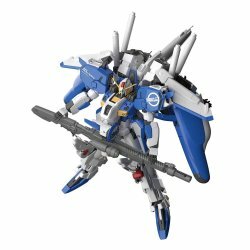 Ex-S Gundam has been upgraded and released from "Gundam Sentinel"! ■ Refresh the shape with the concept of "more like sentinel, more like S Gundam". S Gundam and Ex-S Gundam can be assembled in selective form. ■ It is possible to reproduce the separated coalescence of "G core" "G attacker"..
■ It is possible to reproduce the separated coalescence of "G core" "G attacker" "G BOMER". ■ Head, shoulder, chest, backpack use newly created parts at MG 1/100 PLAN303E DEEP STRIKER. The shape changing parts of the abdomen are also newly shaped. - Beam smart gun and other main arms are included. ■ The hand parts are made newly for flat hands (right and left) which are best for pose possessing beam smart guns. ■ Innocom also renovated and renovated so that you can reproduce not only color but also the scene that shot. ■ Stereoscopic reproduction by multi-structure unique to MG. Built-in high-density frame throughout the body.